Put the sugar, water, cinnamon and rose petals in a pan. Heat gently, stirring until the sugar dissolves. Cook for 10 minutes to form a thin syrup. Leave to cool. Discard the cinnamon and petals. Peel and slice the oranges, grapefruit and pineapple. Peel and dice the kiwis. Hull and cut the strawberries in halves or quarters. Chop the mint, mix with the fruit, then stir in the syrup. 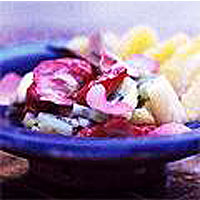 Serve the salad decorated with fresh rose petals and more chopped mint.